Coronary arteries bring oxygen rich blood to the heart muscle. 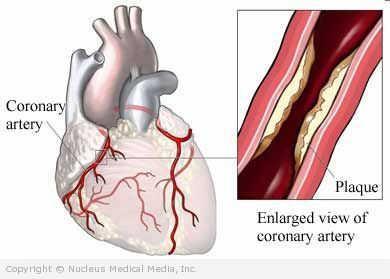 Coronary artery disease (CAD) is blockage of these arteries. If the blockage is complete, areas of the heart muscle may be damaged. In severe case the heart muscle dies. This can lead to a heart attack, also known as a myocardial infarction (MI). Coronary artery disease is the most common form of heart disease. It is the leading cause of death worldwide. Sedentary lifestyle — Poor fitness can also increase your risk of CAD and premature death. A diet that is high in saturated fat, trans fat, cholesterol, and/or calories — Drinking sugary beverages on a regular basis may increase your risk of CAD. CAD may progress without any symptoms. Immediate medical attention is needed for unstable angina. CAD in women may cause less classic chest pain. It is likely to start with shortness of breath and fatigue. If you go to the emergency room with chest pain, some tests will be done right away. The tests will attempt to see if you are having angina or a heart attack. If you have a stable pattern of angina, other tests may be done to determine the severity of your disease. This medicine is usually given during an attack of angina. It can be given as a tablet that dissolves under the tongue or as a spray. Longer-lasting types can be used to prevent angina before an activity known to cause it. These may be given as pills or applied as patches or ointments. A small, daily dose of aspirin has been shown to decrease the risk of heart attack. Ask your doctor before taking aspirin daily. These may help prevent angina. In some cases, they may lower the risk of heart attack. Medicines, like statins, are often prescribed to people who have CAD. Statins (eg, atorvastatin [Lipitor]) lower cholesterol levels, which can help to prevent CAD events. Some studies have shown that CABG may be more effective than PCI. Lifestyle changes and intensive medicine may also be just as effective as PCI. Enhanced external counterpulsation (EECP) — large air bags are inflated around the legs in tune with the heart beat. The patient receives 5 one-hour treatments per week for seven weeks. This has been shown to reduce angina and may improve symptom-free exercise duration. Transmyocardial revascularization (TMR) — surgical procedure done with laser to reduce chest pain. Researchers are also studying gene therapy as a possible treatment. Eat a heart healthy diet that is low in saturated fat, red meat and processed meats, and rich in whole grains, fruits, and vegetables. Treat high cholesterol or triglycerides. Ask your doctor about taking a low-dose aspirin every day. In certain patients, taking rosuvastatin (Crestor) may be another option. Talk to your doctor.